Agusti, R.; Casadevall, F.; Olmos, J. This paper presents a comparative study of 16-QAM, 32QAM, 64-QAM, and 128-QAM 140 Mbit/s digital radio in the presence of multipath fading. Conventional T -spaced and fractional tapspaced equalizers have been considered to compensate for the ISI-induced symbols. The performance measure used is the bit error ratio (BER); thus, upper and lower bounds on BER have been developed. Based on this calculation procedure, results showing the net fade margin versus the gross fade margin have been obtained in a variety of cases that include the presence of both nonlinear and linear equalizer structures. Agusti, R., Casadevall, F., Olmos, J. 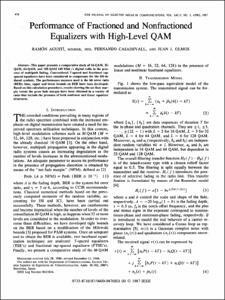 Performance of fractioned and non-fractioned equalizers with high-level QAM. "IEEE journal on selected areas in communications", Abril 1987, vol. 5, núm. 3, p. 476-483.